The Main North: Learning how to do Scenery on the Main North. It beats doing DCC installs. 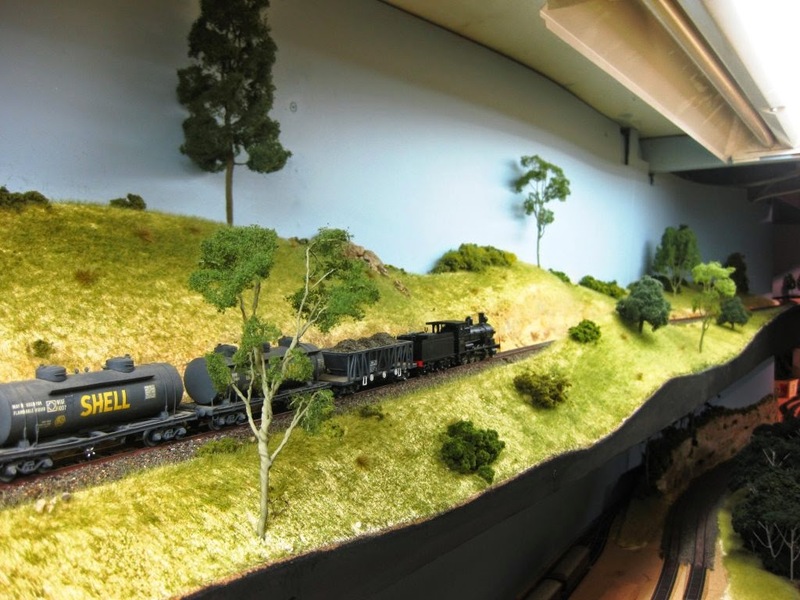 Modelling the last years of Steam on the NSWGR's Main North, with DCC. Learning how to do Scenery on the Main North. It beats doing DCC installs. Yesterday I posted my first Blog entry in 3 years indicating there have been major changes in my life – retirement, home renovations and most importantly, changes on the Main North. If the activity on this Blog is any indication, many of you here following, thought nothing would happen, well it has and it’s also surprised me. The renovations have been completed so I have the rest of my life to finish off the painting, landscaping and getting my new “garage/shed” in order, for the moment I’m into trains 24/7, playing, planning and working on my layout. The plywood junction is slowly being replaced with scenery. Initially I was helped by my mate Brian from Townsville, colloquially known as the “Northern Terrorist” with the scenery on the Murrurundi to Pangela line above Gosford. After Brian returned home, I had to keep the ball rolling, with 3 more sections done. 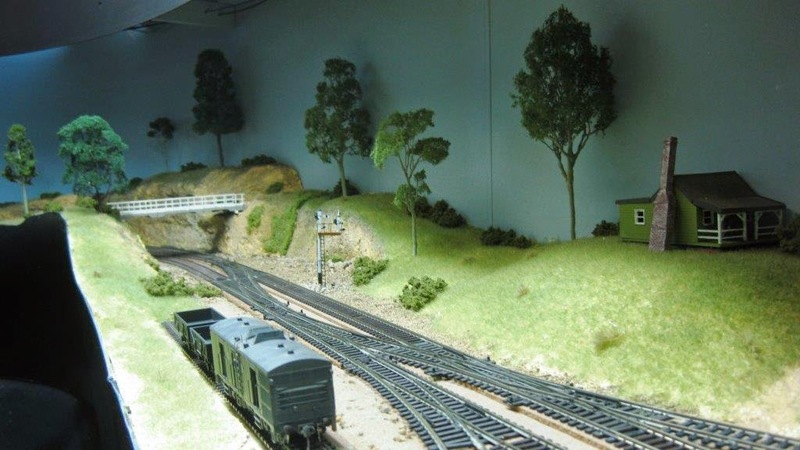 The newly sceniced areas still need the fine detail like ballast, fences, Telegraph Poles, station detail etc. to be added. 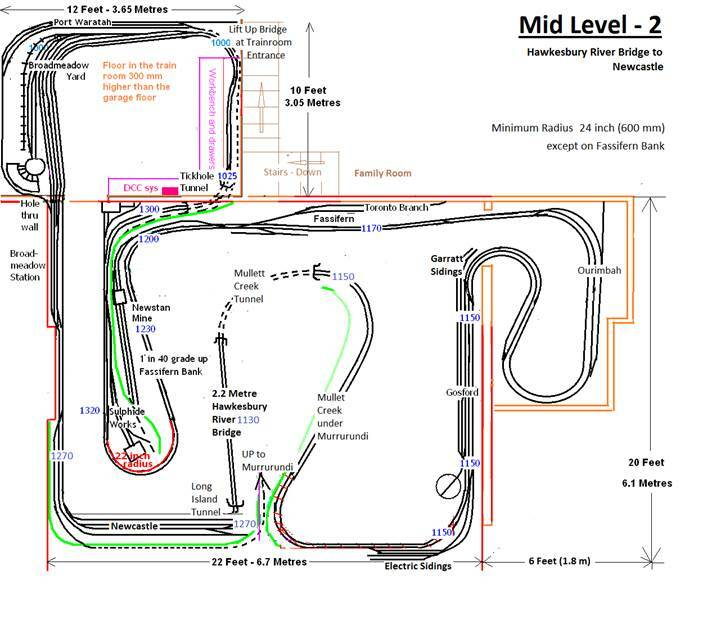 With track plan of Gosford completed, I thought I’d better attack the section of track above Gosford prior to installing the “overhead” to minimize damage to the Gosford’s overhead. While planning the scenery prior to Brian’s week at the Main North, I phoned Brian as he lived at Murrurundi in the 70s, I asked if he had a photo of the bridge over the Pages River - no was the answer but he said he’d see what he could do and that was 9.00 pm. At 10.00 am the next morning there were some photos of an NR crossing the Pages River Bridge. Brian’s brother went out and photographed it at sparrows fart. Now I had to model the bridge. Thanks Kevin and Brian. Using my scaling method and Google Maps, I worked out the bridge should be about 100 scale feet long. My nearly completed Pages River bridge.. 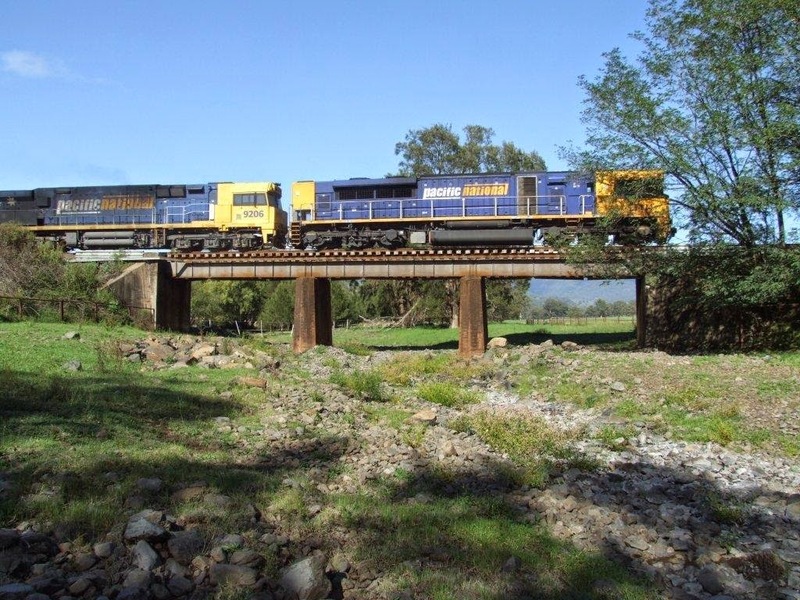 The total mainline length of the Double Deck Main North is now 115 metres excluding the two Return Loops at Sydney and Gunnedah, so scenicing the Main North will certainly take some time but a start has been made. I have been surprised with the efforts. Wow what a difference scenery makes, when playing trains on the sceniced Main North. I wish I had started with the scenery, much earlier. Upper Deck - Murrurundi to Pangela track looking towards Murrurundi with with the Pages River Bridge. Looking back towards Pangela that's located in the "reclaimed space",deep under the house. Running further north towards Werris Creek, heading towards the eastern portal of the Ardglen Tunnel. The Tunnel is only a metre long but goes through a right angle, into Ardglen Station. A small part of Fassifern is shown in the lower L/H corner. Exiting the western portal of the Ardglen Tunnel. The future Ardglen Ballast Quarry will be behind the sandstone above the loco/tender. Ardglen. Brian made the Station about a year ago, so a better home is long overdue. Under the two houses on the Hill and behind the large tree in the foreground is the track to the Ardglen Ballast Quarry. The "white" Newstan Mine Bin can be just seen in the lower L/H corner. and shown below. Lower Deck - Newstan Mine with 22 loaded BCHs under the Bin ready for the trip to Port Waratah. A second Garratt will light engine from Broadmeadow, shunts the Van onto the BCHs then couples up to the first Garratt. The coupled Garratts push the train on to the mainline. With the complete train on the Down Main the Double Garratts attack the 1 in 40 grade up Fassifern Bank. Using QSI's Heavy Load feature, in these Eureka Models Garratts, this makes a truly magnificent train operation, just like what happened in the late 60s. At Broadmeadow, the Garrattts are "run around" the train then separated. 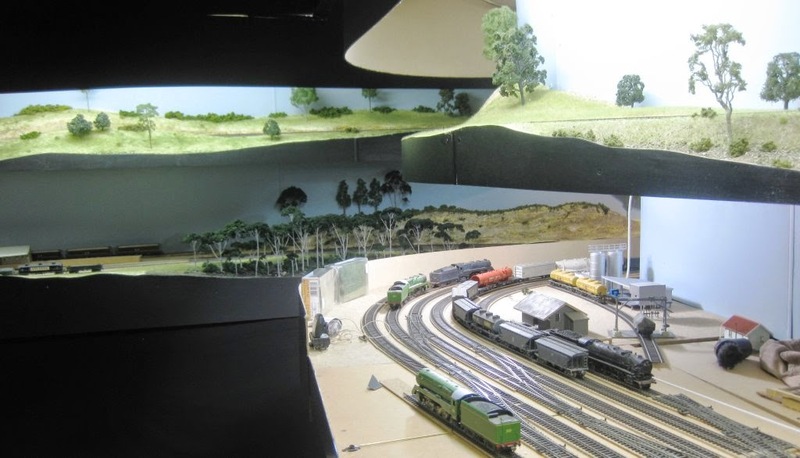 One Garratt is placed in the Yard and serviced while the other Garratt pulls the train into Port Waratah (the Back of Broadmeadow). 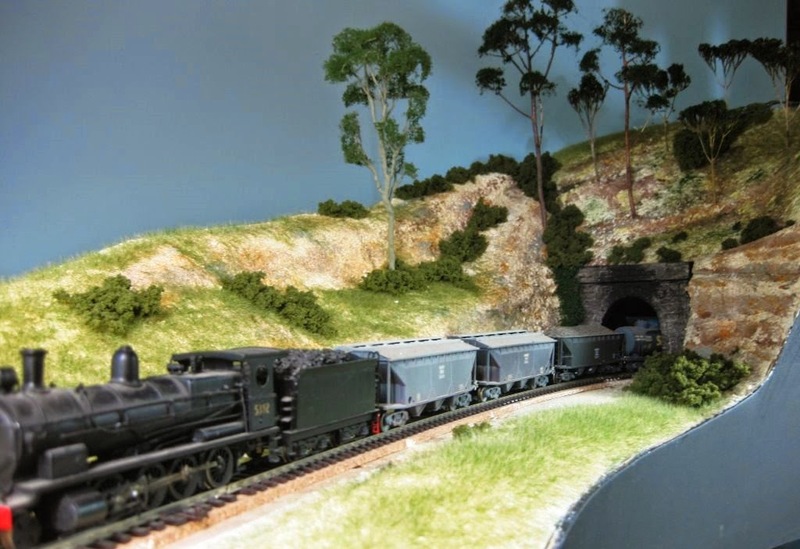 There is no room for full BCHs so the train continues on via a Sneak Path under Sulphide Junction and back to Newstan Mine with the Garratt and the BCHs re-positioned under the Bin. This takes the operator about 45 - 60 minutes to do. Fassifern showing the Wakefield Road overbridge. The Newstan Mine track veers off to the right just beyond the bridge. I need to paint the house in the foreground, white as this house is very clearly shown in many of the Fassifern photos I have seen. R/H lower - North Gosford with the Garratt Sidings and the Up Refuge (22 inch radius) on a curve with the change from steam to a 46 in progress. R/H upper - North of Pages River Bridge. Rear Lower - Fassifern and my "home grown" Sedum Gum Trees. A future topic on the Blog. Rear Upper - south of and up to (going north), Ardglen Tunnel. Most trains on the Main North in the mid 60s were steam hauled. Werris Creek bound (Down) trains were assisted over the Range with a "rear end" banker connected to the train at Murrurundi. A second operator is necessary to run the Banker. Two operators working in tandem over this 25 metre section of newly sceniced track with two sound equipped Standard Goods etc, wow what fun. To make this operation easier and overall running of locos, I "speed match" ALL of my locos to a maximum speed of 30 MPH. Using 28 Speed Step mode, the Procab's Speed display indicates the approximate MPHs of the locos. This makes "banking" a little easier with both loco's s displaying the same an approximate MPH reading. For extra reading see my previous 30 MPH max speed matching entry in my Blog. 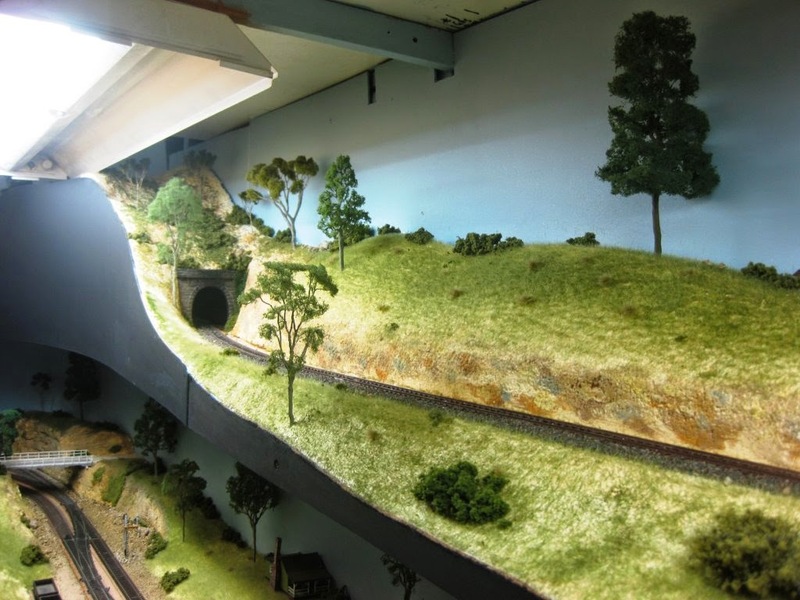 The Grass is made using 6.0 mm long Static Grass from MiniNatur and applied to the layout with a "home made" Grassinator from an article by Ray Pilgrim using a $14 Negative Ion Generator from Oatley Electronics here in Sydney and PVC plumbing parts. A future Blog Topic. Contact me if you want the Grassinator article. 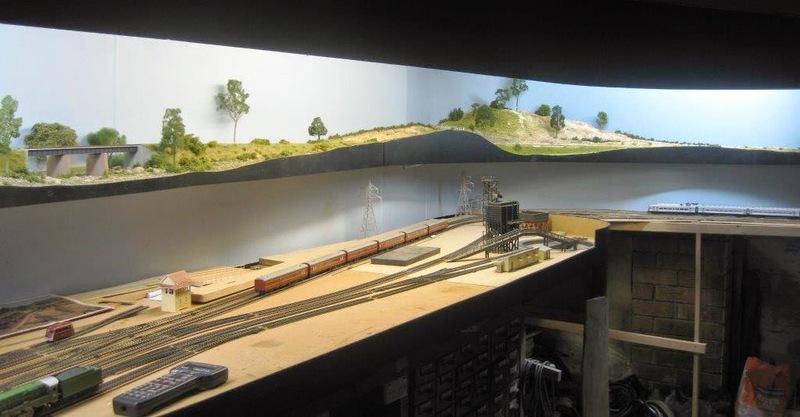 I have been busy on the layout for the last couple of months. Much more to do but doing scenery is lots of fun and with the results, very rewarding. Wow, once you got over your nervousness about scenery you certainly have taken off like a rocket, well done!!! Talk to you tomorrow night about it. Aiming for scenery like what you guys have done but I'm very happy with my progress. Operating is so much more fun. Very nice scenery there Marcus and for a second I thought you had succumbed and added NRs and 93s to your roster lol . Fair dinkum Marcus! That was all bare plywood and track suspended in space that last time I saw it! Amazing progress! I agree with James, and you are a lot further along than I am. My Shrike projects are taking too much of my modelling time. Well done Marcus and stay well mate. Too many other train related jobs are getting in the way of doing more scenery. If I could only get going with scenery again it'd be great. Hi Marcus. That's quite an ambitious project but it is looking quite good. A bit bigger than my smaller efforts. 30 MPH Max Speed "Matching" of ALL my Locos. Sugar Cube Speakers from SBS4DCC - Unbelievable. NMRA X2011 Convention in Sacramento USA. My Revised Signalling Theory & the SCMRA Epping Seminar. Signalling the Broadmeadow to Werris Creek section my way. Operating the Track Cleaning "Hanna" Van on the DCC Main North. Official Opening of the Main North's Hawkesbury River Bridge and more Scenery.